Founder of the Aldine Press, Aldus Pius Manutius (1449 – 1515) was the first to print high quality, affordable authoritative editions of nearly every classical text in Greek, Latin and the vernacular. He was born in Bassiano in Lazio and raised in a wealthy, scholarly Humanist environment; his closest friend was the great Florentine philosopher Pico della Mirandola. Aldus was devoted to ancient Greek, and around 1490 he moved to Venice, attracted by the numerous Greek scholars who had taken refuge there after the fall of Constantinople, and by the library left to the city by the Greek Cardinal Bessarion, an early promoter of the classics in Italy. Aldus played a major role in inventing a Greek typeface. A stickler for quality, he used the finest paper and employed Francesco Griffo, Italy's master typeface cutter who invented fonts still used today, including Garamond and Bembo, named for Aldus's great friend and fellow Humanist Pietro Bembo. Beautiful editions of Aristotle, Aristophanes, Thucydides, Herodotus and Sophocles rolled off the Aldine press (located on the site of Cassa di Risparmio bank in Campo Manin). 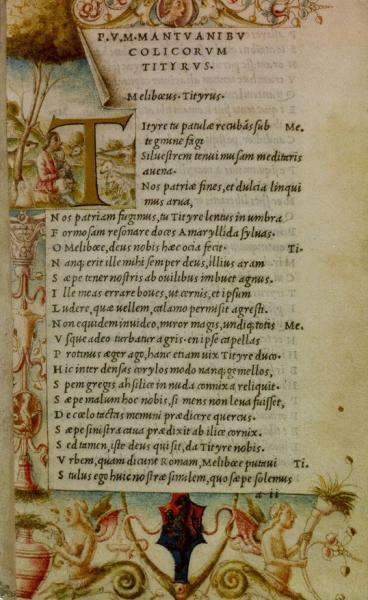 Works in Latin and vernacular Italian ranged from Virgil (his 1501 edition included the first use of italics, which took up less room and used less paper, to keep costs down) to Dante and Petrarch. Unlike other printers, Aldus published The Divine Comedy without cluttering the text with annotations. He invented the semicolon, and in 1503 produced the portatiles, the first easily portable book. He printed contemporary works as well, including Francesco Colonna’s beautifully illustrated philosophical romance, Hypnerotomachia Polifili (or The Dream of Polyphilus, 1499) that may have inspired the design of Longhena’s masterpiece, Santa Maria della Salute. He printed Bembo's influential dialogues on courtly love, Gli Asolani (1505). In 1508, Erasmus, who came to Venice to help print his own Adages, a best-seller in its day. 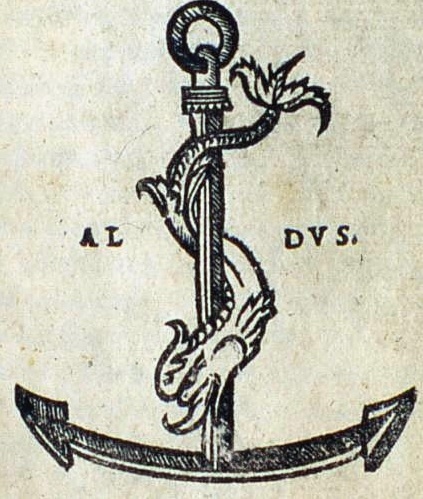 Bembo inspired the famous Aldine colophon when he gave Aldus an ancient Roman coin with a dolphin and an anchor. Aldus first used it around 1499 to symbolize his motto Festina Lente or 'Hurry up slowly': the speed of the dolphin with the firmness and weight of the anchor. It wasn't long before other printing presses in Italy and France copied it and tried to horn in on his business. Doubleday Books uses it to this day. Aldus eventually merged his press with (and married the daughter of) Venetian printer Andrea Torresani da Asolo. Although he died in poverty, the Aldine press carried on for two more generations. His grandson, Aldus the Younger, is credited with codifying the rules of modern punctuation. As a footnote, another printing firm, Paganino & Alessandro Pagagnini were inspired by Aldus to produce the first mechanically printed Qur'an (Koran) in 1538, a daring feat during the Counterreformation: by 1620 all copies were said to have been destroyed, according to rumour either by order of the Pope or by divine justice. No one was sure if the printing even occurred—until 1987, when Professor Angela Nuovo discovered a single copy in the library of the Franciscan friars of San Michele in Isola, inscribed with the name of Teseo Ambrogio degli Albonesi, an oriental scholar of Padua who died just after 1540. Experts examining the book, however, found errors on every page, some serious. So maybe the Muslims themselves destroyed them.